At the end of May and beginning of June we spent three weeks in Pennsylvania visiting our church family at Liberty Bible Church and stayed with our good friends the Williams family. Our time was filled mostly with visiting and getting to know families in the church more. It was a great time and we were blessed by the visit there! We came back to NH for about 12 days to visit with Jonathan's sister Beth and her family who was home from Mexico for a few weeks. 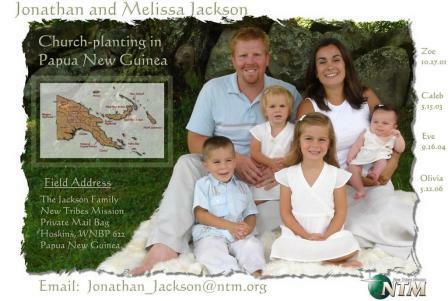 (they are missionaries there) After a great visit with them we loaded up our van again and headed to Missouri to visit my side of the family. (Melissa's) I enjoyed some yard saling and shopping with my Mom and sister and also a good time at my parents time share in Branson! While still in Missouri, on July 10th, we got a phone call that Joanna was in the hospital and would not make it through the night. About 5 minutes later we got another phone call to say Joanna had gone to be with the Lord. Jonathan called his brothers and sisters to tell them the news and through sadness we tried to figure out our next move. In about 30 minutes we were all packed and in the van headed back to NH. This was at midnight on a Friday. We drove 20 hours straight and then stayed the night in Syracuse, then traveled 6 hours the next day and went straight to the Jacksons. Of course there were many tears as the reality set in. It was hard to see Curtis and our hearts just broke for him. The only thing to lean on was and is the Lord and the joy that comes from knowing Joanna knew the Lord and she is now living with Him! It is a comfort to know she has no more cancer, no more pain, and no more suffering. That doesn't take away the fact that we miss her though. We miss her mischievous smile and her great ideas. The next Wednesday was the memorial service for Joanna. It was a time to cry and be sad because we miss her and all the wonderful things she was. But also a time to reflect on our own lives and ask if we were as sold out to Christ as Joanna was. She was a witness of the Lord in her life and her death, and has left an amazing testimony of her devotion to the Lord. We ask the Lord how to move on now, and leave our emotions and tears at His feet. I'm so thankful He is the God of all comfort and the Sovereign God. We can't understand all His ways, but just pray for Him to direct our every step. Continue to pray for Curtis, who is only 27 and has just lost his bride of 6 1/2 years. He now has the huge responsibility of caring for his daughter who is 5, his son who is 4, and his youngest daughter who is about 18 months old. Continue to pray for the rest of the family who lost a daughter, sister, granddaughter, cousin, and friend. So we turn now, with our eyes on Jesus, still believing He knows what is best for us, and still loves us more than anyone. The day after the service for Joanna the Jackson family took a day away at the ocean. It was a good time to smile, watch the kids climb on rocks, play marbles, eat and laugh. We joined the family a bit later in the day because we had a Dr. appointment in the morning. Our whole family joined me for my ultrasound and as we heard the technician say, "It's a BOY! ", I started to cry!!! We were so happy to hear the Lord has given us another son, which was a huge desire of our hearts! We announced the news when we met the family at the beach and they all cheered for us! It was a great moment! Two days later we saw two of our friends get married, then we left after the wedding headed for Cape Cod. Jonathan spoke in his Grandmother's church the next morning and we had a good time re-connecting with some of the people there. We spent 4 days on the Cape with Jonathan's Gramma, enjoyed the beach, then traveled back Thursday. We are home now but not for too long! We were excited to hear Jonathan's brother, Micah, got engaged on Monday and is planning an August 8th wedding! Their sister Beth is here from Mexico, so they are trying to fit in the wedding while she is still here! August 3rd we will be headed to Pennsylvania to enjoy Micah and Susan's wedding! Well, I think that is all for now! Thanks to all of you who have been praying for our family and the extended Jackson family. We feel surrounded by your prayers and are very thankful for them!